ROME (CNS) — “Laudato Si’,” the title Pope Francis chose for his encyclical on the environment, comes from a hymn of praise by St. Francis of Assisi that emphasizes being in harmony with God, with other creatures and with other human beings, said the head of the Franciscan order. 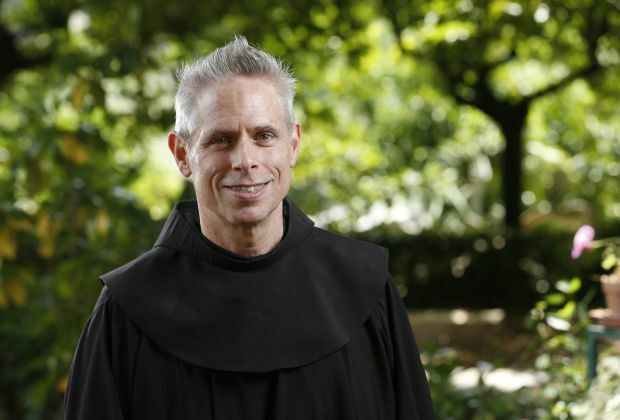 The canticle is incomplete, though, without St. Francis’ praise of human beings “who give pardon,” bear infirmity and live in peace, Father Perry told Catholic News Service June 12. Also essential is St. Francis’ embrace of “Sister Bodily Death” as the portal to eternal life. The interconnectedness of all creatures should help people to recognize that when they hoard riches and resources, they are harming their own brothers and sisters, especially the poor, he explained. While St. Francis’ praise of Brother Sun and Sister Moon has been romanticized in many ways, Father Perry said, the obligations it carries are very realistic and concrete: to defend human dignity, especially the dignity of the poor; to promote dialogue and reconciliation to end war; to safeguard the earth and all living creatures; and to learn to live with just what one needs, not all that one wants. Speaking before the scheduled release June 18 of the encyclical, Father Perry said the title signals Pope Francis’ belief that the entire church and all its members must be in solidarity with the poor, “must be about peace” and must respect the planet. By praising nature’s harmony with God, St. Francis’ canticle helps people understand what kinds of relationships they must have in order to live in peace and to give glory to God, he said. Stories about St. Francis, such as the one about him taming a wolf who was attacking the people of Gubbio, could really be stories about how “the population was really terrorizing itself” with family feuds, neighbors fighting and towns battling each other for control of territory and wealth, the Franciscan said. While the Judeo-Christian tradition says God chose to have a special relationship with human beings, it does not mean human beings have a right to exploit and abuse other creatures or the natural environment, he said. “What happens in exploitation without limitation is that not only is nature stripped of its dignity, which God gave it — we cannot deny that — but we are progressively stripped of our own dignity” as those called to care for creation, he said. Father Perry said he expects Pope Francis to use his encyclical to promote an “integral ecology,” which urges respect for the human person and God’s plan for human life, for just social relationships and for care of the natural world. The point is not “to shame” those who are destroying the earth or to disagree with the majority of scientists who say global warming is real and is a threat, Father Perry said. Rather, like St. Francis in warring Italian towns or in the midst of the Crusades, “Pope Francis is trying to be the bearer of that white flag” to promote dialogue and help everyone reclaim their dignity as God’s children called to care for creation. Father Perry urged not just reading the encyclical but studying it with attention to what it is saying about the future of the planet, about Christian discipleship and about ways they can make a difference. I am disappointed in my Pope’s views on climate change. There are so many issues facing my church but the last thing we need is a Pope who leans left. He seems to be an anti-capitalist. More people have had their lives improved by capitalism than socialism. While we can all agree with Pope Francis that everyone should be in solidarity with the poor and should respect the planet, that does not mean it becomes a moral priority above all others for the Church. It doesn’t. Jesus did not die on the cross to save the planet or to eliminate poverty. He died to open up the gates of heaven and to show us the way to eternal salvation if we followed His Word. The Catholic Church was commissioned by Jesus for this very purpose. To save souls from going to hell by converting the world to Catholicism which is the only certain pathway to salvation. What does global warming or climate change have to do with this? For the Catholic Church to be elevating a mostly non religious and secular issue into a moral imperative is a moral tragedy. How can the Church justify moving climate change to the top of its agenda (which is how the whole world will see the Pope’s encyclical) when most of the world still needs to be evangelized, when untold numbers of souls are being lost to societal decadence and religious unbelief, when the Church is morally stagnating and loosing Catholics everywhere except in less developed and third world poorer countries, when untold millions of unborn babies are being slaughtered, when the sacrament of marriage and religious freedoms are being torn down and trashed, and as Catholic minorities are being persecuted, tortured and killed in great numbers and right before our eyes? Less important but relevant nevertheless, one has to also wonder why the Church would risk its institutional reputation by jumping into the manmade climate change fray while it is still being debated and has not been universally decided? Also knowing full well that the global warming (now climate change) lobby groups that the Church is aligning with (UN, government, corporate, and academia) are all reaping immense amounts of wealth, power, and prestige from this issue and where there is already evidence of corruption, collusion, and falsification of the data. It is one thing for the Pope to issue a statement or two and to share his personal thoughts on climate change. It’s another thing to issue a more formal and official encyclical that carries to full weight and reputation of the Church. Is the Church considering the consequences to the Church if it turns out that climate change is not primarily manmade or that there was dishonesty within the climate change lobby and they were found to be fudging the numbers? When the Pope speaks on moral and church doctrine I will defend what he says but when he leans socialistic and liberal and a shade communistic I must disagree with him. He is very vague on the benefits of capitalism. He supports the same ideas as Al Gore who spewed them on the American public – global change or warming or any other name given to unproven theories. The people of the 13th century were told the sky was going to fall. The next thing I expect to hear is the movement for sainthood for the Jesuit’s Berrigan brothers.